Published July 28, 2014 By Leisa Good This post may contain affiliate links. Regardless, I only recommend sites I've researched and/or used and trust. Are you looking for a transcription job? Can you type 80 wpm with excellent proofreading and grammar? Do you have advanced knowledge of both Microsoft Word and Excel? 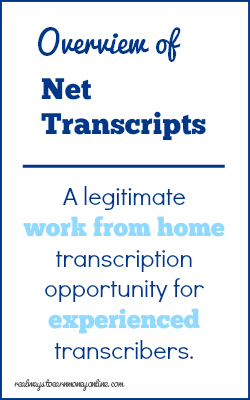 Then Net Transcripts might be the right work-at-home job for you. Net Transcripts hires transcribers in the US only. What Exactly is Net Transcripts? Net Transcripts is a company that offers transcription and translation services to law enforcement agencies, government agencies, medical seminars, financial conferences, and general business companies. They have been in business since 1988 and are a licensed GSA Contract Holder. They have been rated in past years as one of the top 100 companies in Arizona. Net Transcripts hires both the Law Enforcement Transcriber and the General Transcriber for everything that would not fall under the category of law enforcement. While Net Transcripts does offer transcripts in at least 11 other languages, all transcribing is done in the United States. All work is guaranteed with a 98.8% accuracy, and they accept all major audio/video file formats. What is the Pay and When is Payday at Net Transcripts? It appears pay is made twice monthly, on the 1st and 15th of each month via direct deposit to your bank account. There isn't much information online to be found regarding the pay rate for this company because their contractors are asked not to reveal it. It is clear however that they pay per minute of audio transcribed. Some of the Glassdoor and Indeed reviews state that pay is on the low side, averaging around $10 per hour. What you earn with Net Transcripts will depend on the deadline of the audio you're transcribing. Shorter deadlines pay more, whereas deadlines that are further out pay less. an updated computer and laptop. see a list of equipment often used by work at home transcribers. Net Transcripts will also be providing a guideline for their transcription. Net Transcripts wants to hire experienced transcriptionists with good command of the English language. If you apply for General Transcriber, they want financial interpretation experience. If you apply for the Law Enforcement Transcriber, they want experience in law enforcement or criminal justice as a transcriber. Net Transcripts will go over most of the information after you apply and pass a criminal background check (it appears they may cover the cost for this). Everything you do as a transcriber is web-based, and you will use their FTP client to upload your audio files. Are You an Independent Contractor or an Employee at Net Transcripts? At Net Transcripts you are an independent contractor and responsible for your own taxes. Most independent contractors only work part-time at Net Transcripts. Should you make over $600 a year, they will send you a 1099 Income Tax Form. When you apply, you're asked your availability in the online form. It looks like you can work part-time or full-time. However, some of their contractors have reported that the workload is pretty unpredictable. Sometimes you end up with more work than you can handle and other times there isn't enough. The company does let you choose from orders with different deadlines so that way you're not taking on work that you're not sure you can complete. What Do People Think Of Net Transcripts? It seems to have an overall good, sound reputation and has been in business for 26 years. There are several contractor reviews posted on both Indeed and Glassdoor that you should check out if you're serious about applying here. To summarize, most workers are pretty happy. There are some complaints about the pay not being quite enough and work occasionally running out due to the fact they already have a lot of contractors working for them. But on the flip side, people love the flexibility, good communication, and prompt pay. It was mentioned more than once that this company is never late on pay. How Can an Interested Applicant Apply? Go to the career page and select whether you want to be a Law Enforcement Transcriber or a General Transcriber. Just follow the online application instructions.